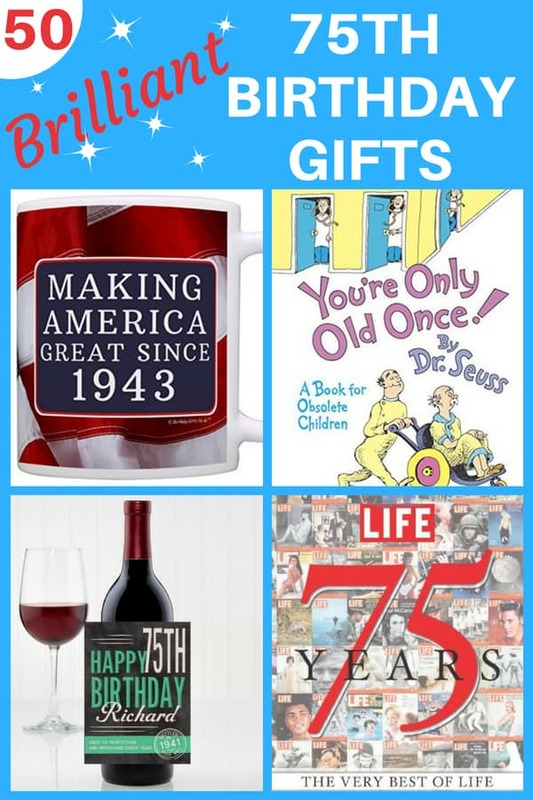 Top 75th Birthday Gifts - 50 Best Gift Ideas for Anyone Turning 75 in 2018! 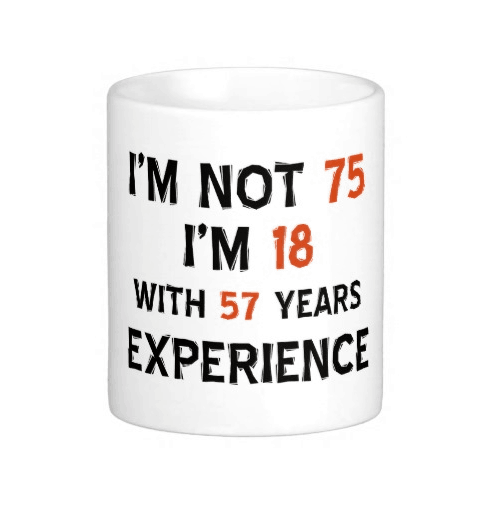 It's not easy finding the perfect 75th birthday gift! At this age, most people have everything they want or need. And you want to find a gift that will help make this milestone event a memorable celebration. 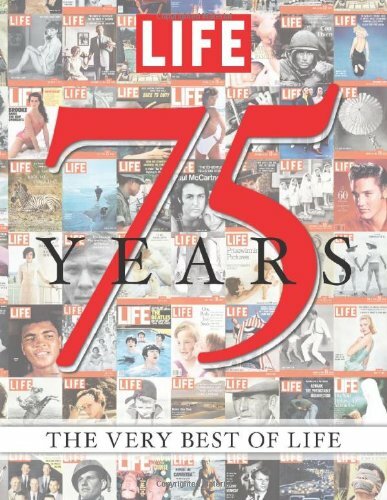 No need to worry – just check out this list of the top 75th birthday gifts. These presents should fit the bill for just about any senior citizen. 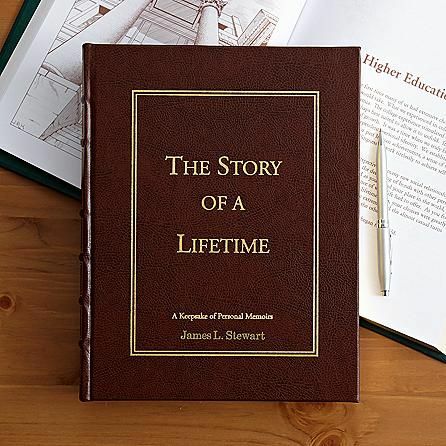 So much has happened over the past 75 years - and this personalized book is the perfect way to commemorate those changes! 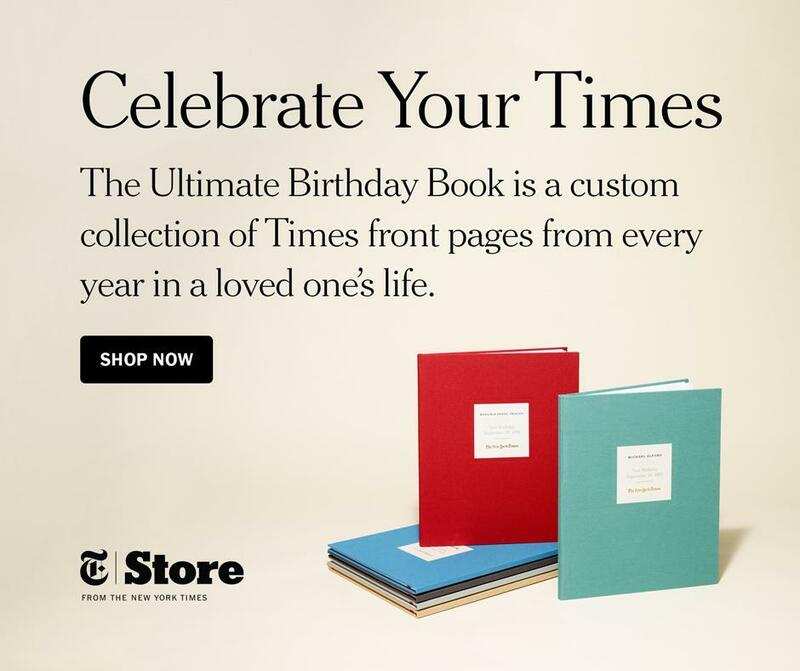 Striking personalized book contains a copy of every NY Times front page on the birth date during the person’s lifetime. The Ultimate Birthday Book - an enhanced version of the less-expensive ($100) Custom Birthday Book - contains around 140 pages. It includes an exclusive 24 page photo-packed timeline, as well as a collection of world-changing front pages. This best-selling gift is available in your choice of leatherette ($155) or premium linen ($190) covers in a handsome gift box. 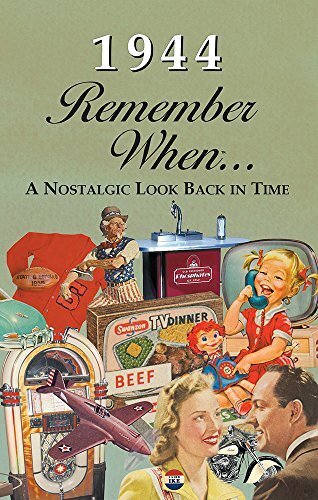 What Was Life Like in 1944? A momentous occasion such as this is the perfect time to look back and see how much life and society have changed in 75 years – and this unique personalized plaque is the perfect solution! 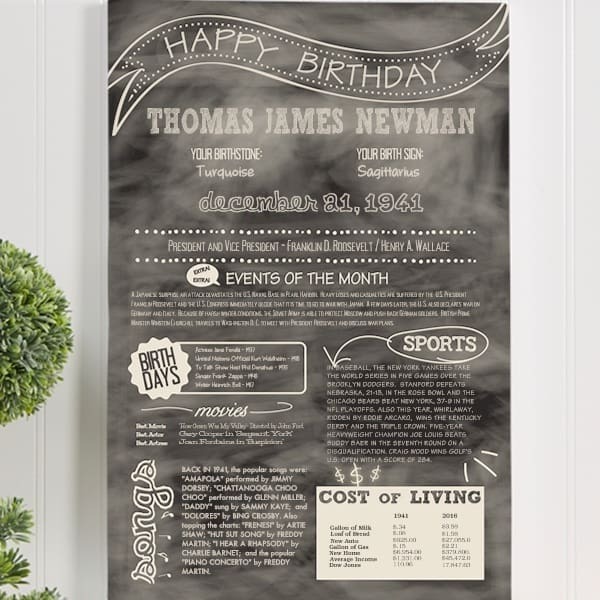 The top of the chalkboard-style sign is personalized with name and birth date. The remainder of the canvas details what life was like on the day the recipient was born, including cost of living comparisons, the names of the president and vice-president, as well as celebrities who share this birth date. The sign also includes the top news stories, sports results, and songs that were the highlight of this day. This gorgeous leather-bound journal is the perfect way to preserve a lifetime of precious memories. This unique book asks 500 questions that range from simple queries about life events to thought-provoking personal reflections. The recipient will be delighted with the chance to capture their life in writing; future generations will treasure these recollections for generations to come. The gilt-edged pages also include spaces for a family tree as well as blank pages for photos and mementos. A gift that will be shared and treasured for generations! 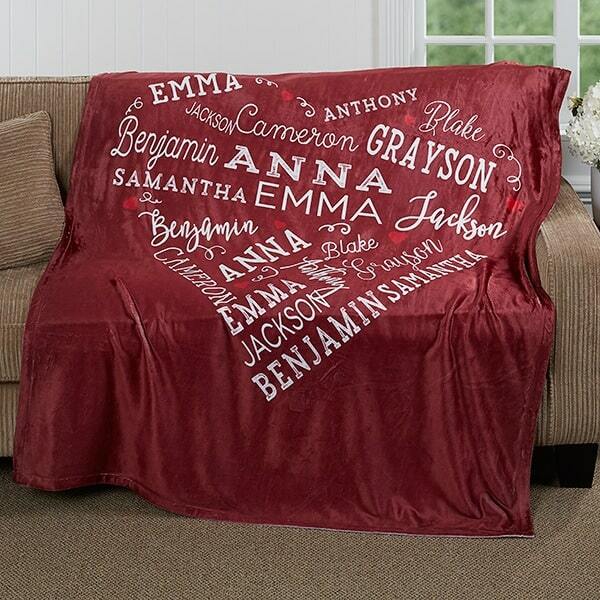 Wrap someone special in love and comfort with this super-soft personalized blanket! Up to 21 family member's names are printed in a repeating fashion to make a delightful heart shape. A unique gift that will bring hours of enjoyment! 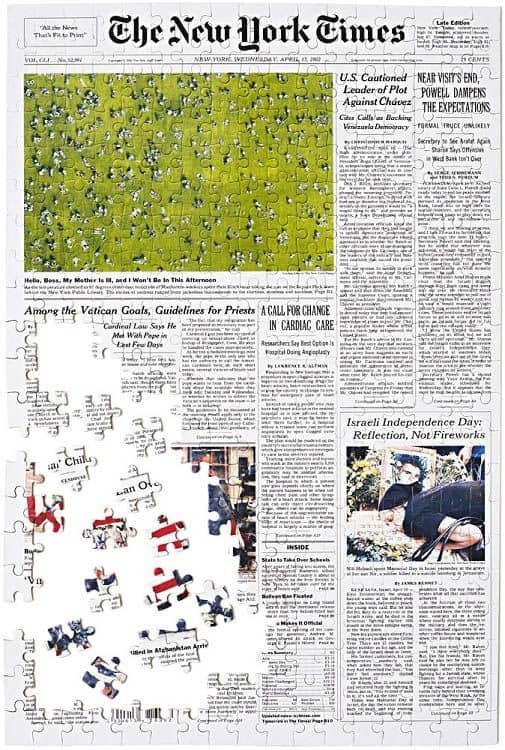 Available in 3 sizes, each puzzle is an exact replica of the New York Times front page of the requested date. Comes complete with a paper reproduction of the front page as a reference point while assembling the puzzle. Make them laugh out loud with this delightful book by everyone’s favorite author! This comical look at growing older features Dr. Seuss’s signature illustrations and clever rhymes. A fun and lighthearted gift for “obsolete children”. Gift baskets are always delightful presents for any age! My top pick for 75th birthday gift baskets is GiftTree. 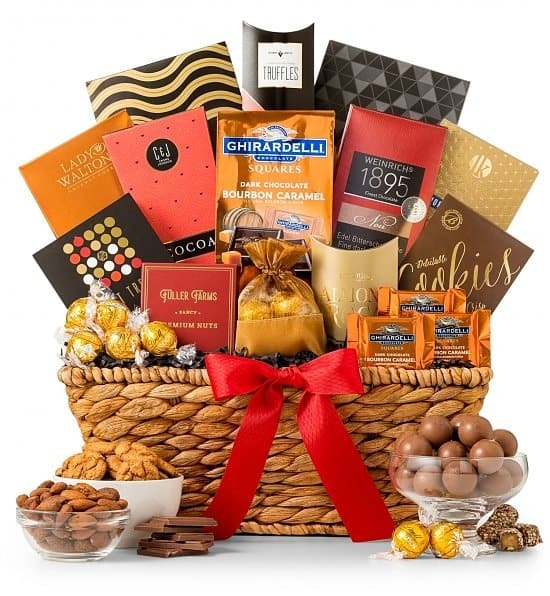 They specialize in elegant gift baskets that are chock-full of scrumptious snacks. 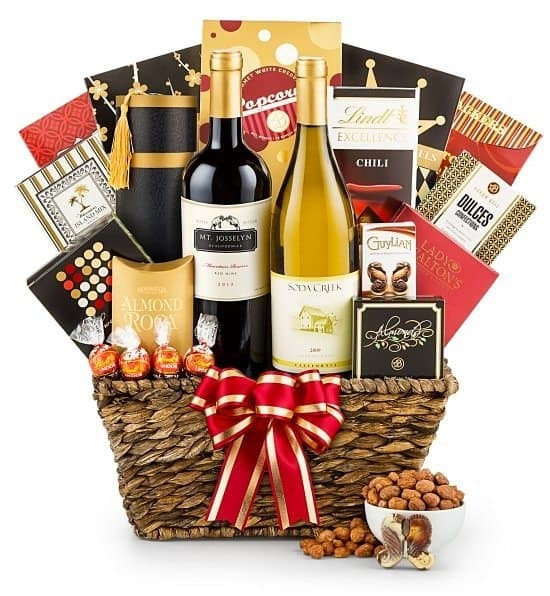 They also offer a wonderful variety of champagne, wine, coffee, and beer gift baskets. But my favorite part? You can order a personalized ribbon that’s created just for your special occasion! Many of their baskets come with option to add a 45 character personalized message that is repeated throughout the ribbon – an elegant way to send a special greeting. Jewelry is always a fabulous gift to mark a momentous occasion. 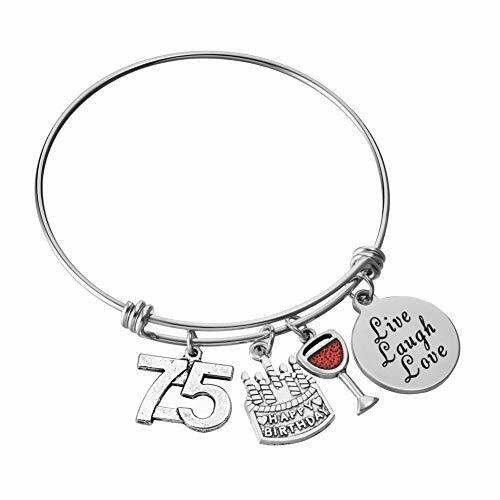 Treat your favorite senior to a special piece of jewelry to celebrate her big day! 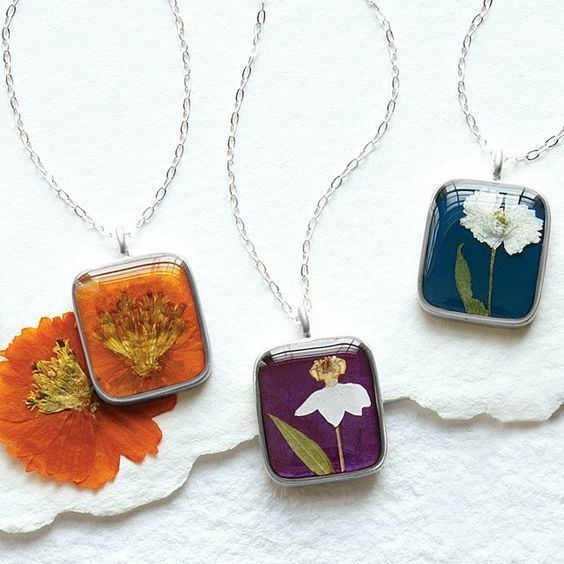 Celebrate her birthday in style with a gorgeous necklace that features a dried, pressed bud from her birth flower. Hand-crafted necklace features a real pressed flower captured in a resin pendant. It's a beautiful symbolic necklace that she will enjoy wearing for years to come! Delight Grandma, Mom or another stylish lady who is turning 75! Striking handmade necklace features a genuine 1944 dime coin. 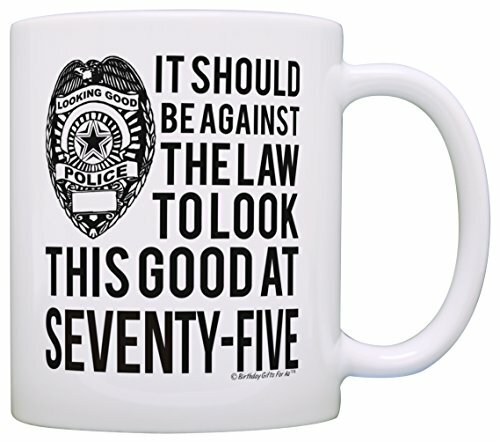 Fun coffee mug is the perfect gift for the senior with a sense of humor – or denial! An inexpensive gift (under $20) that makes a great stand-alone gag gift or is a fun base for a little gift basket. This popular design is also available on additional gifts, including a shirt, hat, plate and more! 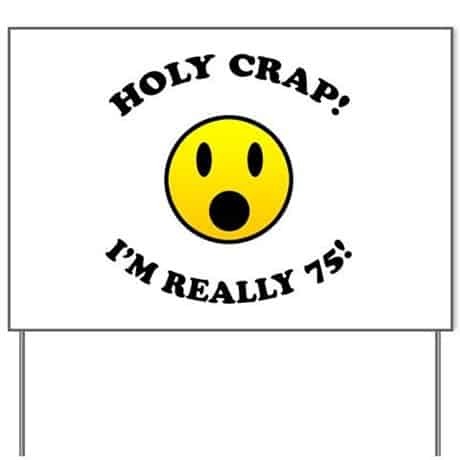 Click here to see additional "I'm Not 75" gifts. 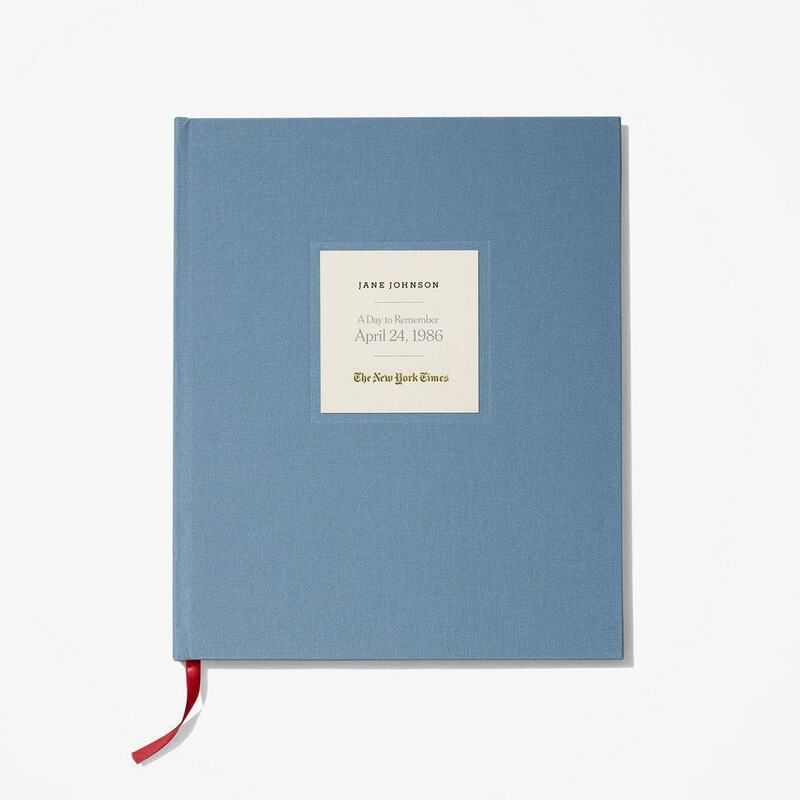 Unique personalized book features a reprint of The New York Times from the day you were born. It’s a great conversation-starter that makes a wonderful addition to any library or coffee table. An elegant way to commemorate this milestone birthday! Important events almost always call for new clothes, and this birthday is no exception! 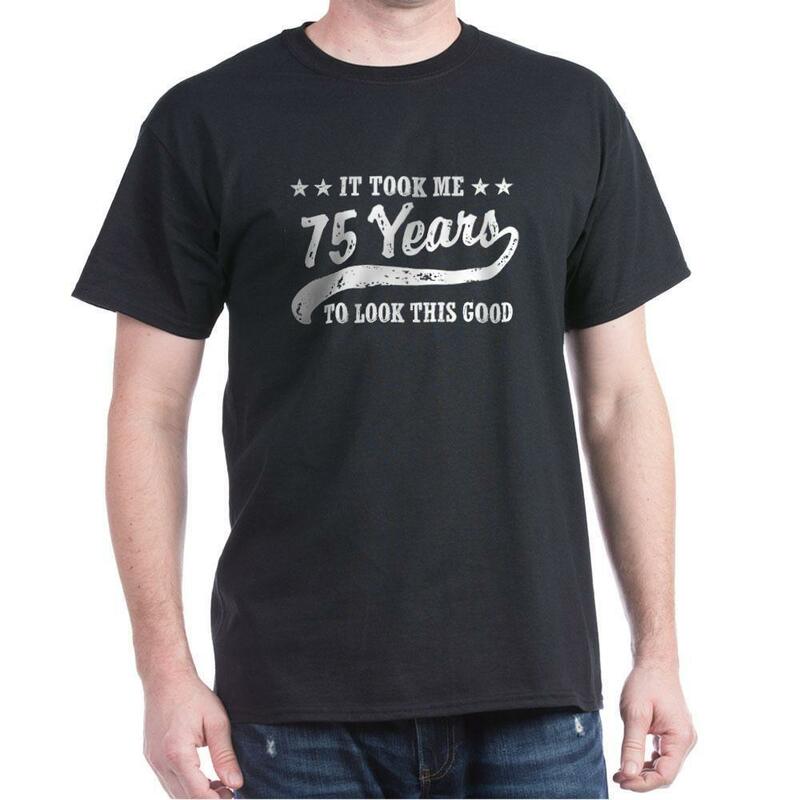 Deck the birthday gal or girl out in style with a fun 75th birthday shirt. 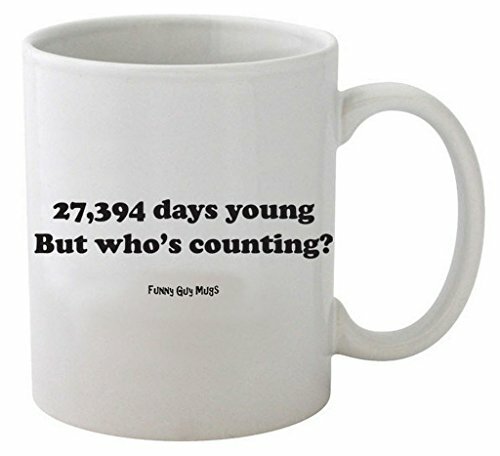 CafePress offers several hundred 75th birthday shirts for both men and women. Most of the designs can be ordered in a variety of styles, including sweatshirts, golf shirts, and long sleeved t shirts. 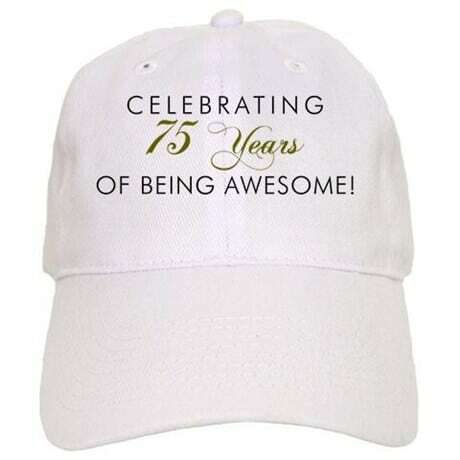 They also offer a great variety of hats and other 75th birthday clothing items and gifts. This charming personalized frame is a creative way to display a favored photograph from this milestone celebration! This cheerful frame is personalized with first and last name. You can include up to optional nicknames if you’d like. The age is displayed as both a number and printed out, and you can add the birth year as well as the current year. You have a choice of 6 color schemes, so you can find a frame that matches the decor or picture perfectly. In a hurry? Use the express shipping option for quick turnaround. A unique gift that’s sure to look great anywhere in the house! 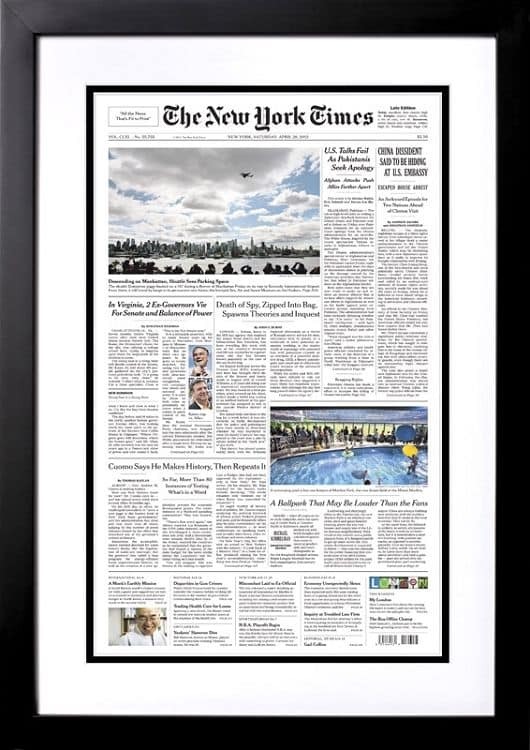 Custom-printed reproduction of the New York Times front page from the day you were born comes with a certificate of authenticity. Choose framed or unframed in your choice of 3 sizes. Includes a tea light that can be easily replaced when worn down. 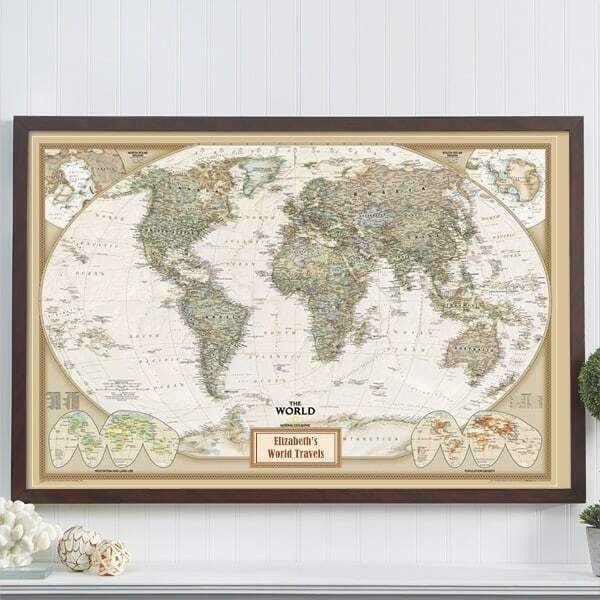 Elegant personalized travel map is the ideal gift idea for anyone who loves traveling! 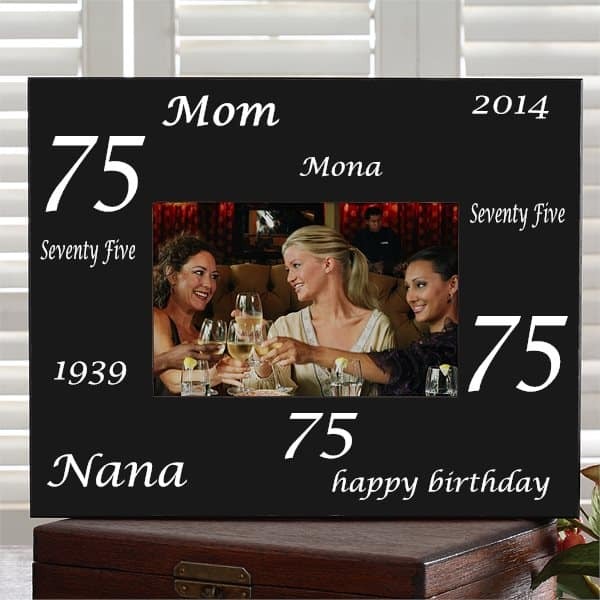 The upscale colorful canvas is highlighted with a personalized plaque with any 2-line message. The gift comes complete 100 color push pins to mark favorite past and future destinations, as well as the locations of family and friends. (You can order additional push pins if needed). 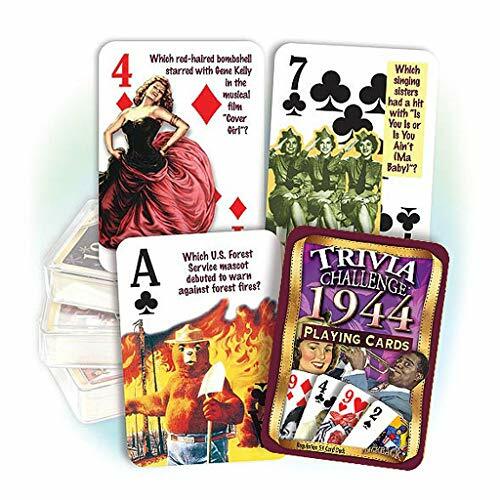 A wonderful way to spark memories and start conversations! Perfect for covering up aging hair and preventing the sun from causing any more wrinkles! 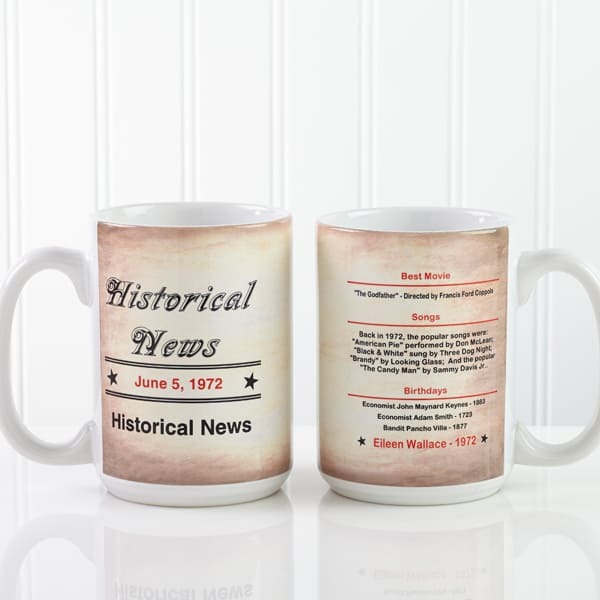 CafePress has an extensive selection of birthday hats, so you can find the perfect one to fit the birthday gal or guy’s personality. Hats would also make great (and useful) party favors. Impress Dad, Grandpa or another favorite man who is turning 75 with unique cufflinks to honor his birth year! Striking cuff links feature genuine 1944 Lincoln pennies. A great addition to the stylish man's wardrobe - sure to be a conversation starter whenever he wears them! Looking for a unique 75th birthday gift for the man who has everything? 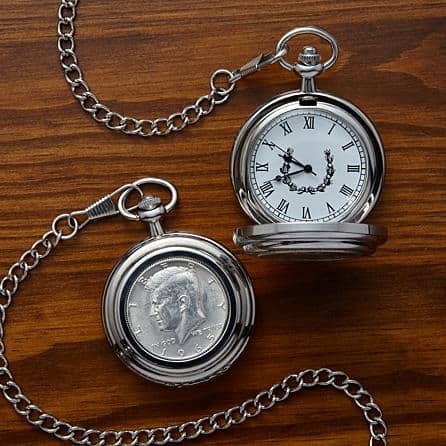 Impress him with a personalized pocket watch that showcases a genuine half dollar from 1944! Handsome watch features a genuine 50 cent coin from 1944 on the front. It opens to display the coin's reverse side and a classic Roman numeral dial timepiece. A memorable gift that's sure to impress! 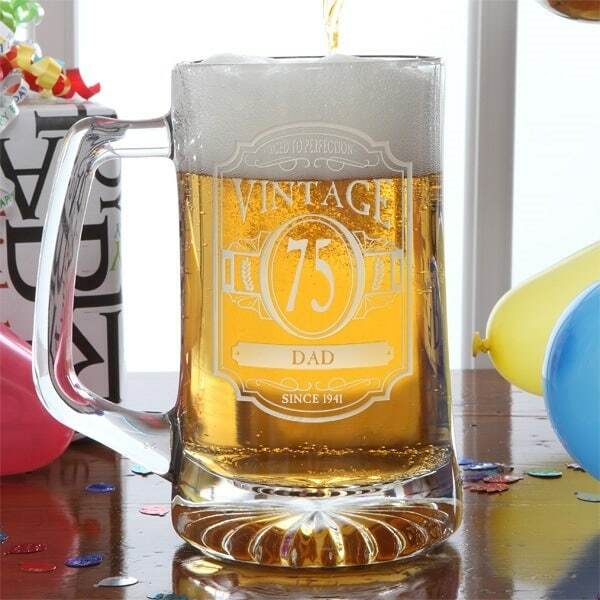 Sturdy beer mug is the perfect way to let him know that he’s aged to perfection! His favorite brew will taste even better when it’s served ice-cold in this personalized beer mug that features his name and birthday. Add your own message at the bottom. 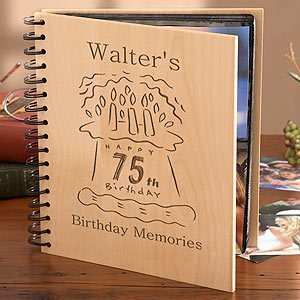 This wooden photo album is a marvelous way to remember all the fun and excitement of the big day! You can choose either a birthday cake or birthday balloons design to be engraved on the front of the cedar wood album. The photo album is stylishly completed with the name and age engraved on the front. Here’s a party tip: bring a permanent marker along and have all the guests sign the photo album. Then you’ll have all the photos and autographs together in one handy memento. This personalized birthday candy jar is a present that will be enjoyed long after the birthday treats are gone. 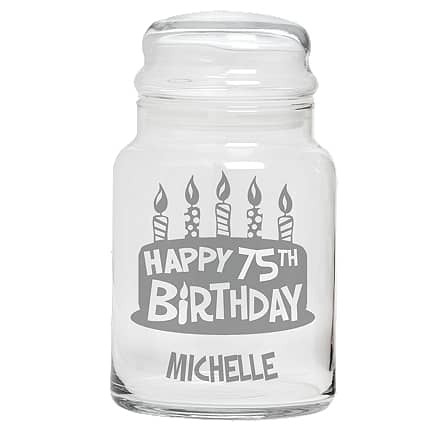 Personalize the glass jar with any name and age. Fill the jar with his or her favorite little candy such as Hershey's kisses - add 75th birthday stickers (shown below) for a special touch! Send the guest of honor long-lasting wishes for good fortunes with this unique personalized Longevity fortune cookie. 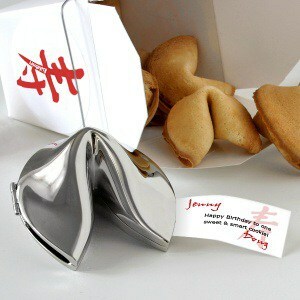 The silver fortune cookie includes a message personalized with any 2 line fortune written in classic Chinese script. You also add your name and the guest of honor’s name to create a one-of-a-kind keepsake. The cookie arrives in a traditional Chinese take out box with the symbol for “Longevity” printed on the box. 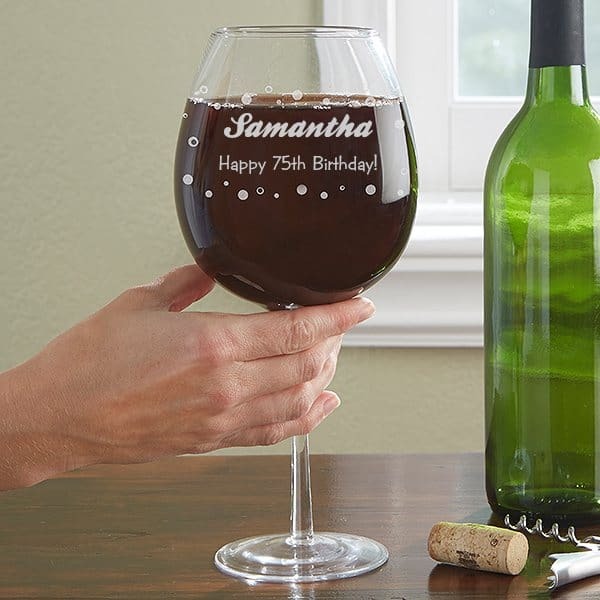 Turning 75 calls for a lot of wine – and this fun wine glass is the perfect way to enjoy it! Oversized glass features a delightful bubble design and can be personalized with any two line message. Fabulous on its own, or add a favorite bottle of wine! 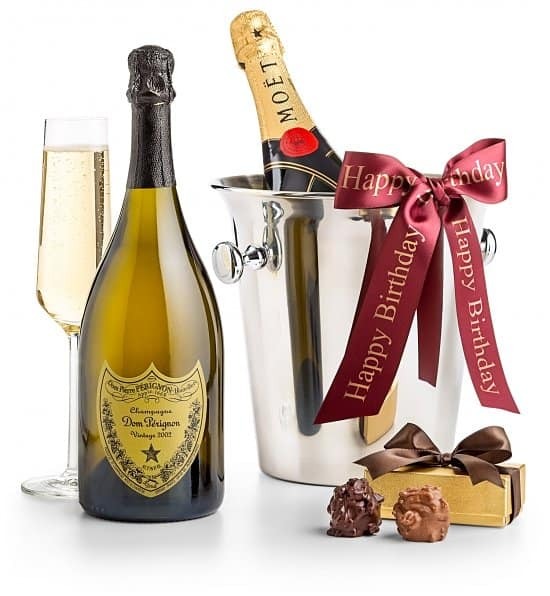 Surprise your favorite man or woman with a birthday gala gift basket this year! Keepsake woven basket arrives packed to the brim with an impressive assortment of savory and sweet treats designed to satisfy even the pickiest person. Add a personalized ribbon for an impressive touch. Obviously an important occasion like this calls for fine wine. Go a huge step beyond ordinary and personalize a special bottle of wine with this fun peel and stick waterproof wine labels! Each label can be personalized with age, birth year, and a 2 line message. A fun gift that’s perfect for a milestone birthday! 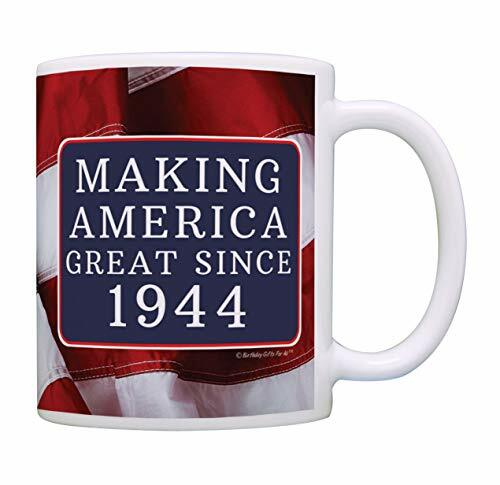 The front of the mug features the recipient’s birthdate. The back features their name and the leading songs and movies from the year they were born. It also features the names of celebrities who share your birthday. Starting at under $15, this makes a wonderful stand-alone gift or add coffee and treats to create a little gift basket. Most seniors take enormous pride and joy in their family. This is a perfect time to recognize their status as head of the family with a personalized family tree gift. 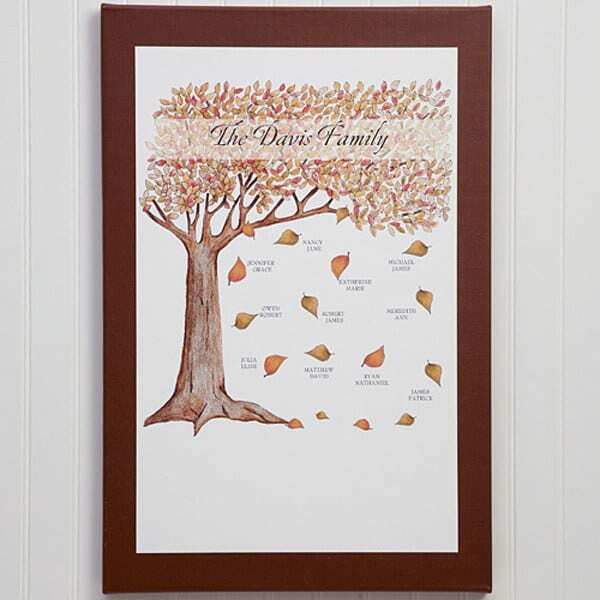 This striking canvas can be personalized with the names of up to 18 family members next to each of the falling leaves – so it’s perfect for even the largest family. The 12″ x 18″ canvas is also customized with the family name at the top, and you can add an optional date on the tree trunk. There’s also space at the bottom of the canvas for a short poem or message – you can write your own or choose from several pre-written verses. Priced at well under $50, this is a sure-to-please gift idea for almost anyone! 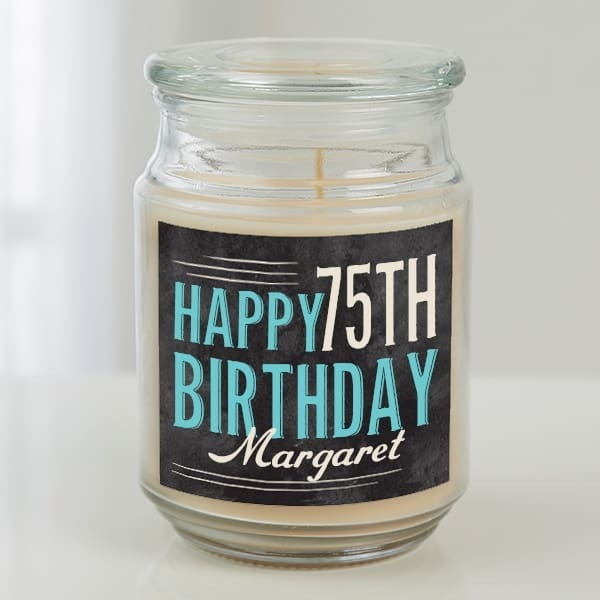 A birthday candle that they can enjoy long after they’ve blown out the candles on their cake! Choose from 5 delightful scents and 5 color label options, then personalize the 18 oz. candle with their birthday year and age. A cheerful gift bucket that’s perfect for the senior with a sweet tooth! 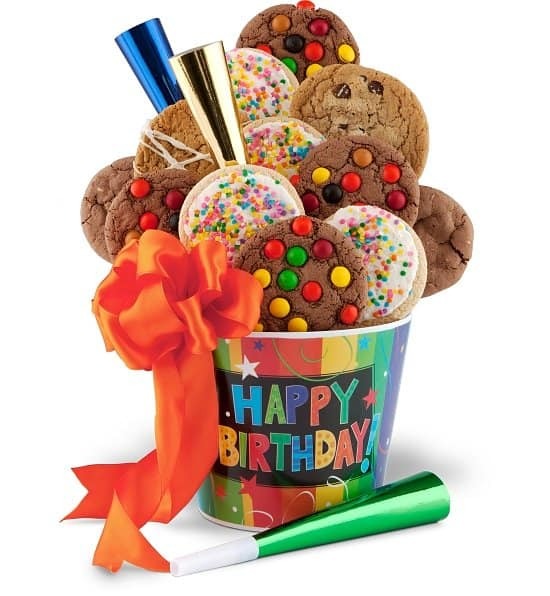 Bright Happy Birthday bucket is packed with 12 bakery fresh individually wrapped cookies in 4 flavors. Includes party horns and a hand-tied ribbon- add your own personal message to the ribbon if you’d like. Ensure that their big day is extra-sweet with a personalized box of chocolates! 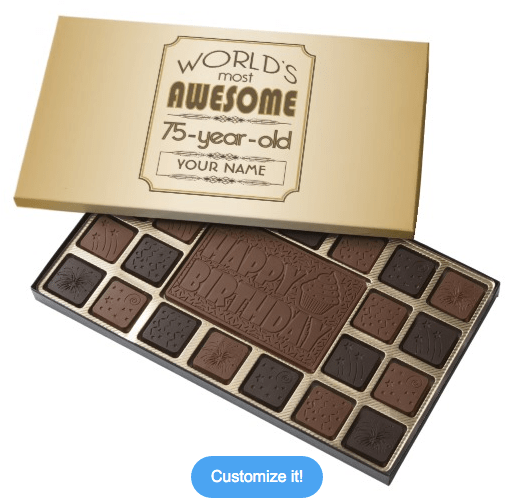 The recipient is sure to get a kick out of seeing the personalized box that honors their birthday, and will love digging into the scrumptious Belgian chocolate. Choose from 20 fun designs..
75 Deserves a Spectacular Toast! A 75th birthday calls for a bottle or two of the finest bubbly! My top choice for elegant champagne gifts and gift baskets is GiftTree. They have a variety of top-notch gift baskets that are sophisticated and classy – and on many of their baskets you can order a ribbon personalized with your unique birthday greeting as well as the recipient’s name. Their offerings vary from less-expensive bottles of bubbly to top-of-the-line vintages such as Dom Perignon, Cristal, and Krug. Prices range from under $50 to over $700, so no matter your budget you’ll find a delightful present. 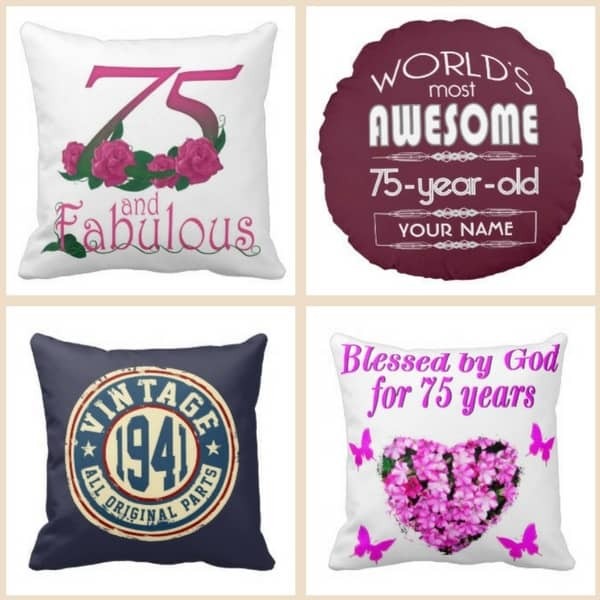 Pamper them on their special day with a 75th birthday pillow! Your favorite senior deserves to sit back and relax after 75 years - these great pillows are a fun and useful home accent. You can choose from over 80 designs ranging from sentimental to funny. An elegant gift that’s sure to impress! 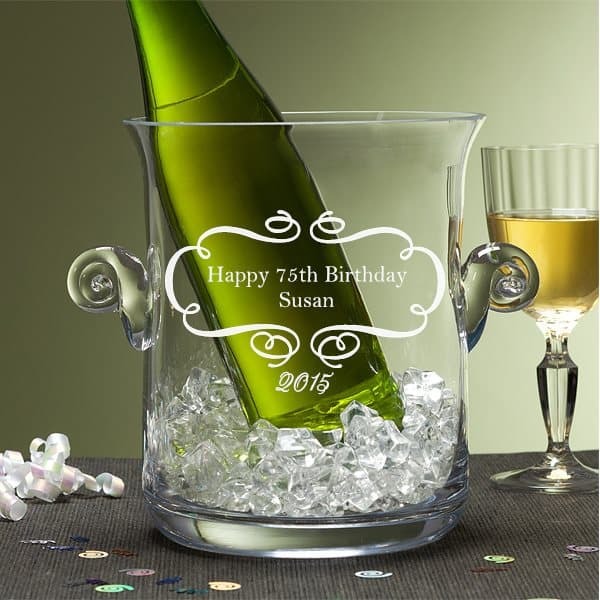 This striking crystal ice bucket is personalized on the front with birthday wishes. Add a quote or poem to the back to create a one-of-a-kind gift that’s a useful remembrance of this special birthday. Few things are more precious than memories, and a photo book full of treasured memories is a gift that the birthday celebrant will enjoy for years to come. Shutterfly is my top pick for photo books – their design tools are easy to use, and the books themselves are gorgeous. They offer several beautiful birthday photo books. For a 75th birthday my favorites are the Forever Young photo book and the Milestone Birthday photo books. If you’re ready to celebrate in opulent style, then this unique gift makes the perfect statement! Your own personal message will be engraved on the bottle in an elegant script. The bottle is then nestled inside a striking lacquered Burlwood keepsake box. A grand gesture for a milestone celebration! 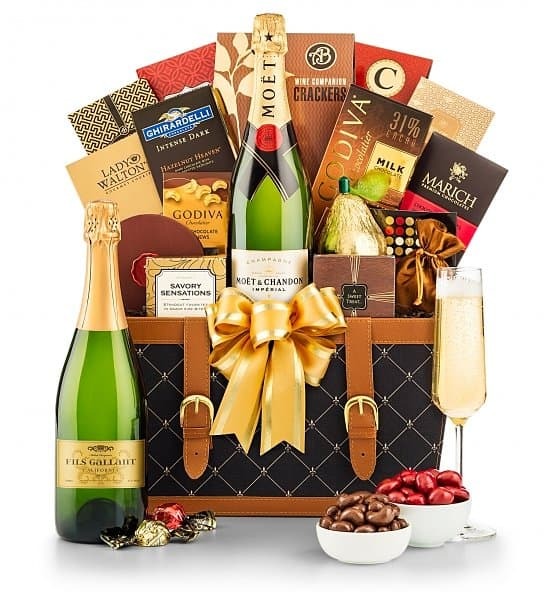 Indulge your favorite 75 year old with this decadent champagne gift basket. Keepsake basket features your choice of champagne paired with a divine selection of gourmet treats. Add a personalized engraved tag for a special touch. Your birthday wishes and thoughts can be displayed always when you send this adorable wooden postcard. 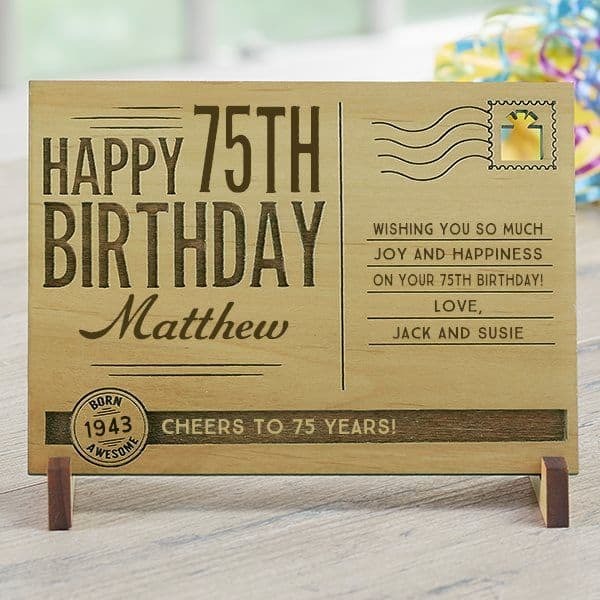 Styled to perfectly resemble a postcard, one side is engraved with your own unique birthday message. You can add up to 5 lines, so there’s enough room for a heart-felt sentiment. The other side is engraved with their name, age and Happy Birthday. 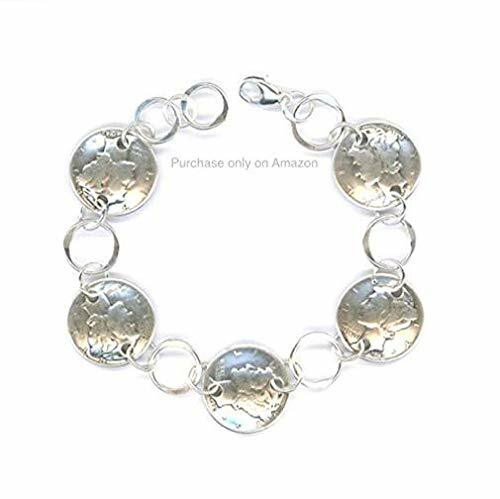 A fun gift for under $25! 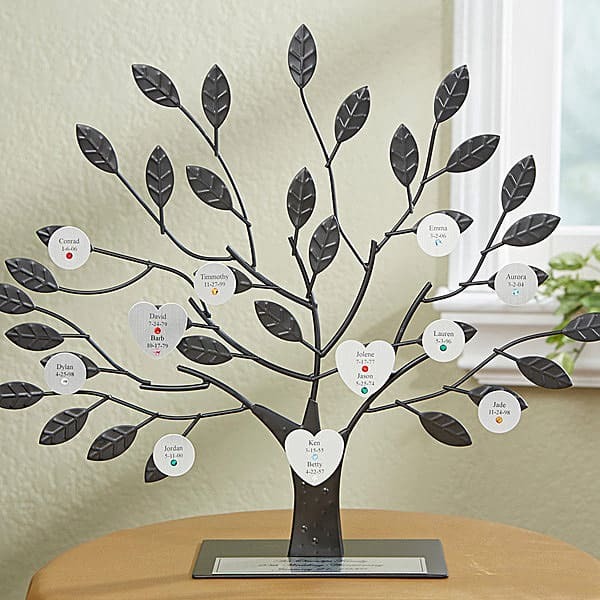 This unique 3D family tree is sure to be given a place of pride in the recipient’s house! Add up to 50 family member’s names and birthstones on individual discs – and you can order more discs as your family grows! Couple’s names are featured on heart shaped discs; children are represented by individual round discs. A plaque at the bottom is personalized with 3 lines of your choice. 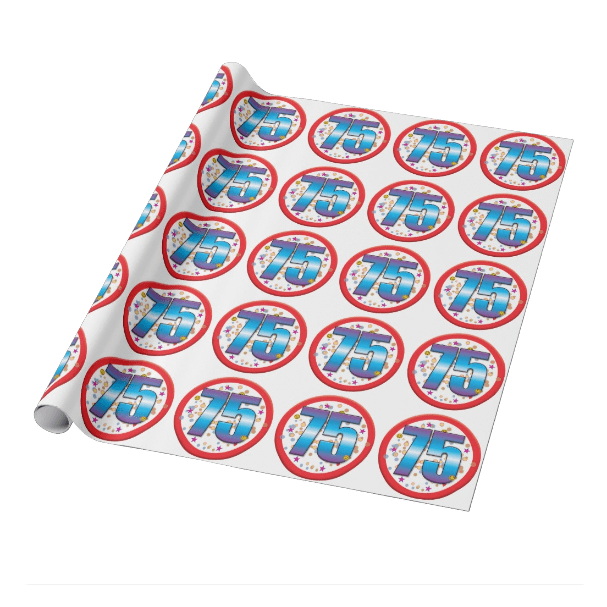 Wrap your presents up in style with wrapping paper especially made for the 75th birthday! 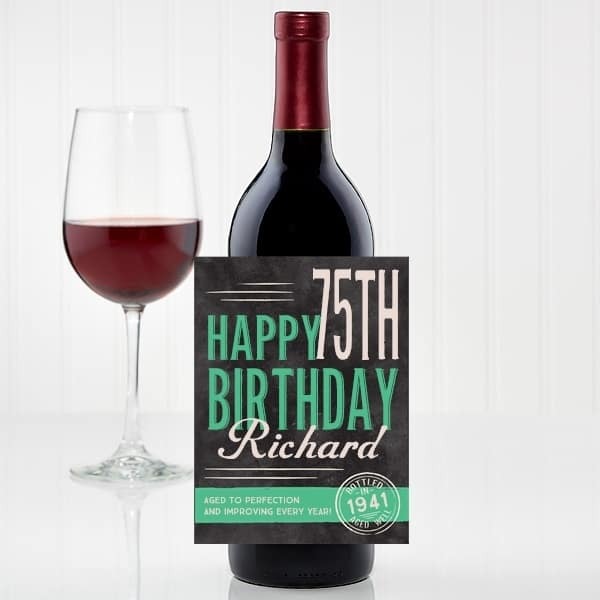 Zazzle has over 130 different 75th birthday wrapping paper designs. You can personalize many of the designs, or choose a favorite color or hobby. A fun presentation idea that’s sure to impress! 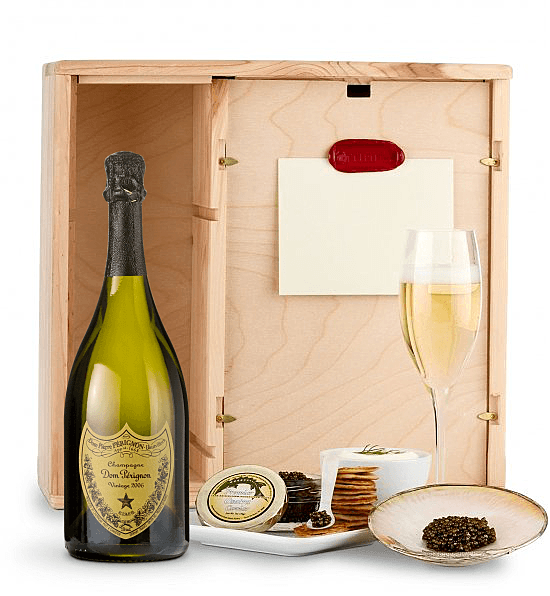 Combine two of life’s delicacies – champagne and caviar – with this prestigious gift basket. The premium gift arrives in a handcrafted Napa wine box. 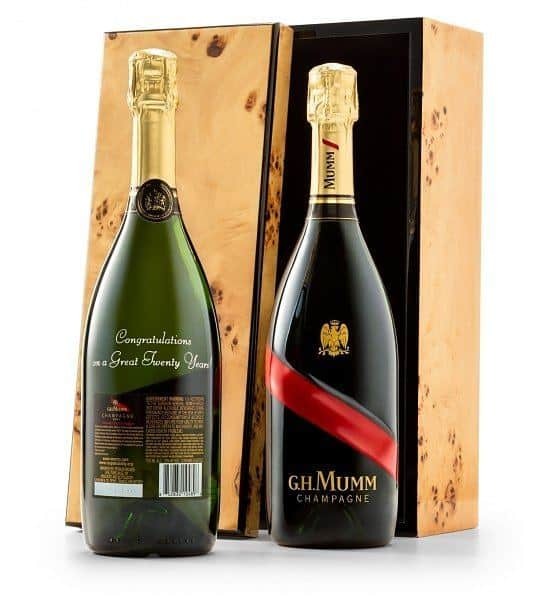 Nestled inside is a bottle of your choice of the world's finest champagnes, as well as 2 oz. of Osetra caviar. It also includes chilled Creme Fraiche, handmade Russian bilinis, and a sterling silver cavair service set for two. Give a once-in-a-lifetime experience that will make his or her 75th birthday truly unforgettable! Greet the birthday gal or guy (and all the guests) with a yard sign that lets everyone know about the big milestone birthday! Flexible vinyl sign is weather-resistant and printed on both sides; metal frame is included. The recipient will enjoy displaying this handsome personalized wine crate long after they’ve enjoyed the wine! 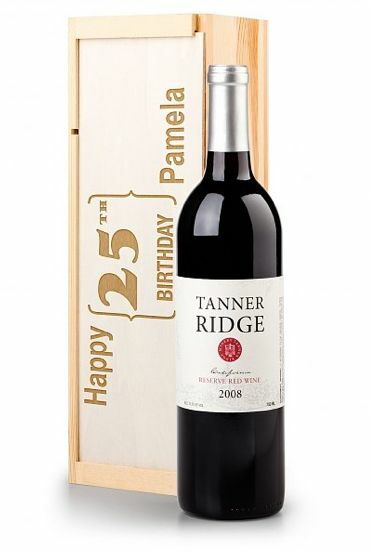 Sturdy crate is personalized with any birthday year and name, and includes your choice of premium wine. An impressive gift perfect for any milestone celebration!